By Default, MS Word prints the header and footer on every page of your document. If you want Word to have a different first page header or footer then follow these easy steps. 1. Click "View" from the menu then select "Header and Footer". 2. On the "Header and Footer" toolbar click the "Page Setup" button. 3. From the "Page Setup" dialog box, click the "Layout" tab. 4. On the "Headers and Footers" panel, tick the "Different First Page" checkbox and then click OK to apply changes. 1. Click Insert from tab menu then hit Header under "Header & Footer". 2. From the dropdown dialog, click "Edit Header". 3. On the Design tab, check the "Different First Page" checkbox under Options group. You can now put a different header on the first page or make it blank. 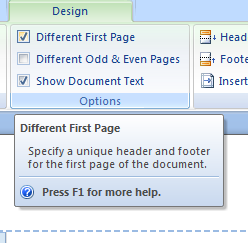 Create a new header or footer in your second page; this will print on all subsequent pages.